Fish Fact: A small, herring like marine fish, often used in appetizers and salads. Meaning: Derived from “Bahamas” – a group of islands in the Atlantic Ocean. Meaning: Second letter in the Greek Alphabet. Fish Fact: Betta splendens, better know as Siamese fighting fish, are one of the most popular species of aquarium fish. Two males should never be kept in the same tank, unless it is a very large tank or the tank has a divider. Tip: A perfect name for a fish that bobs up and down in the water. Tip: This cute name is one of our favorite pet fish names. TV Notable: A 1960s television series featuring a dolphin named “Flipper”. Fish Fact: Flounders are flatfish that live in ocean waters. They have both eyes situated on one side of their head. Meaning: To circulate or move along in a stream. 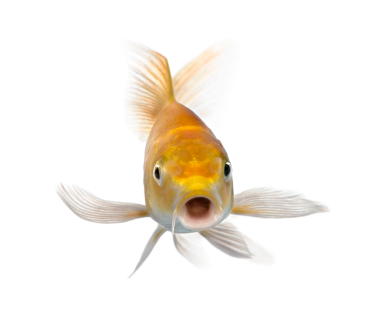 Tip: This is one of the most popular pet goldfish names. It’s not original, but it’s definitely fitting! Meaning: The respiratory organ of fish that helps them to breathe oxygen in water. Another of our favorite pet fish names. Movie Notable: The title of a Steven Spielberg film about a man-eating shark. Movie Notable: The young clownfish in Disney’s “Finding Nemo”. Trivia: The ancient Roman god of the sea. Trivia: Astrological sign symbolically represented as two fish tied together with a chord. Trivia: The ancient Greek god of the sea. Movie Notable: The despairing crab, sent to watch over Ariel in Disney’s “The Little Mermaid”. Tip: A cute name for a tough little fish. Trivia: A fictional sailor who experiences fantastic adventures in his voyages throughout the seas east of Africa and south of Asia. Tip: This name is inspired by the beautiful iridescence of fish scales. Tip: This is a perfect name for a very active fish, especially one that likes to jump out of the water. Trivia: “Splish splash, I was tanking a bath…” are lyrics from a popular Bobby Darin song. Meaning: Food made of rice and rice vinegar and often topped with raw seafood. Fish Fact: A species of small, freshwater South American fish. Many, such as the neon tetra are brightly colored and make popular aquarium fish. Trivia: In Greek mythology, Triton is the son of Poseidon, god of the sea.